With assignments on their plates and expectations to meet, connectivity should be the last thing students need to worry about. So in its effort to provide greater connectivity, TAR UC signed a Memorandum of Understanding (‘MoU’) with redONE Network Sdn Bhd (‘redONE’) on 13 December 2017 at the Kuala Lumpur Main Campus. With the agreement, redONE will be offering special prepaid packages exclusive only to TAR UC students and postpaid packages to TAR UC staff. 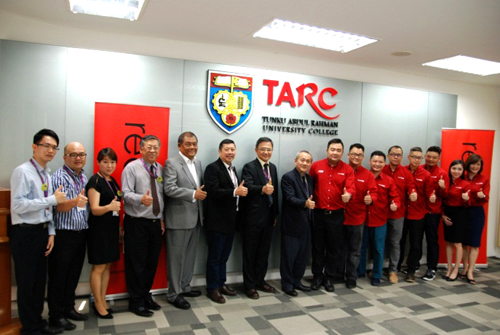 As the only telecommunication provider in Malaysia to allow phone calls even without credit, TAR UC students are able to stay connected with their peers and lecturers at all times. “We at TAR UC understand how important it is to stay connected, be it for academic purposes or just to keep in touch with your family. So collaborating with redONE will benefit our students not just through this special package offer but also facilitating future collaborations with redONE,” said Datuk Dr Tan Chik Heok, President of TAR UC, in his speech. “We thank TAR UC for trusting us, and let’s help the students enjoy campus life to the fullest,” Mr Ben Teh Beng Hock, Chief Sales Officer of redONE, added. The ceremony concluded with Datuk Dr Tan and Mr Ben Teh signing the MoU, witnessed by Mr Tan Seng Seng, Director of the Department of Student Affairs and Mr Jacky Kho Lian Heng, Head of Business Intelligence of redONE Network Sdn Bhd, followed by an exchange of souvenirs between Datuk Dr Tan and Mr Ben Teh. Datuk Dr Tan (second from right) exchanging handshakes and the signed MoUs with Mr Ben Teh (second from left). Accompanying them are Mr Tan Seng Seng (rightmost) and Mr Jacky Kho (leftmost). Datuk Dr Tan (left) exchanging souvenirs with Mr Ben Teh after the signing ceremony. Datuk Dr Tan (eighth from left) poses in a group photograph with Mr Ben Teh (ninth from left), representatives from redONE Network, TAR UC’s senior management and staff.